A mind lively and at ease: Mama Masha's Kitchen - Let's get saucy! Mama Masha's Kitchen - Let's get saucy! Mama Masha's Kitchen began as an aid to people who are afraid to cook, people who have fully functioning kitchens but never use them and are actually at risk of starving to death next to a full refrigerator. I think we have reduced some of that risk with the previous posts that walked people through some fairly simple meals. So, I think we can move on to the next phase – sauces. The simplest easiest thing to work in with things to top the base (veggies, shrimp, smoked clams) is browned butter with garlic. You can get chopped garlic in big jars usually sold in the fresh produce section of the grocery store, so you don’t even have to deal with peeling it, splitting it into cloves and then trying not to cut off your finger tips while chopping the cloves into tiny little pieces. 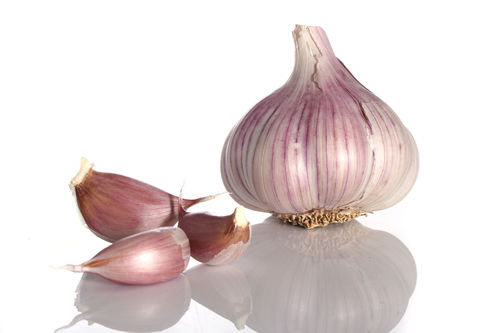 And the garlic juice from the jar is a great flavor booster. To brown butter, heat up a small cast iron pan, cut a chunk of butter about the thickness of a small match box, drop it into the pan and just let it melt in there and sort of swish it around. Do not walk away – you do need to keep an eye on it so that it does not scorch. However, this does not mean you cannot multi-task. In a larger pan, toss in a bit more butter, garlic, garlic juice and whatever you were going to server on top of your base. Keep an eye on that butter, especially if you have an electrical stove. As soon as the butter starts turning brown, turn the pan off. Drain your pasta or fluff your rice, top it with your toppings and garlic, then pour browned butter on top and mix it all together. Done! Browned butter also works great with chopped onions or, if you don’t like onion or garlic, you can use it with any mixed veggies. And I am not going Paula Dean on you here – I am not suggesting that no recipe is complete without a stick of butter. We are talking about maybe two table spoons. Believe me, a little bit goes a long way to add flavor. Incidentally, that is why I prefer low-fat things to fat-free things. 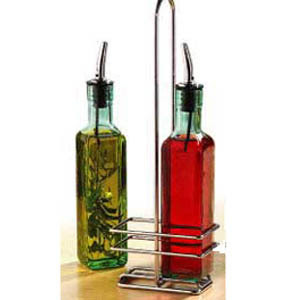 American food manufacturers in particular frequently add artificial texturizers and sweeteners to compensate for lack of flavor in fat-free foods in the absence of natural fats, like the ones that come from oils and butters. On the other hand, in low-fat foods, there is just enough fat to significantly boost the flavor. You also get additional benefits, because there are some vitamins that are fat soluble, which means you actually need some type of fat to metabolize them and get the advantage. Fat-free anything just makes them sail through your system. So, find your balance – use a little bit of fat or oil in your diet. This next one doesn’t even need a separate pan. Again – the same premise: we are cooking the base of our meal somewhere off to the side and we are pulling together something to go on top. Use a big cast iron pan, add some olive oil – just enough to coat the bottom and a little of the sides of the pan, throw in your veggies and fish or meat. Once they are about half cooked (this is when I love frozen veggies – it’s the point when they are completely unfrozen and are starting to get a little softer), add a healthy splash of balsamic vinegar. Stir things to get them coated in balsamic or, if it is a slice of fish or meat, slide it around the pan and flip it over a couple of times to get that flavor on. Once everything is cooked and you are ready to serve, add just one more splash of balsamic, get your pasta ready, put your toppings on top, but don’t turn off the heat under the pan, in which you cooked the veggies and the meat. You will still have some balsamic in the pan. Keep stirring it, as it bubbles up a little. This is high-end stuff, people – we are making a balsamic reduction! After a little bit, the stuff will thicken and brown. Turn it off, and pour on top of your pasta and toppings. The same trick can be done with wine – white for fish and chicken, red for beef, and pork can go either way. My favorite red wine reduction is a slight alteration to a recipe Mama Masha’s daddy used to make (no, that does not make him a Grandpa Masha). It starts with – yes – pasta. Spaghetti is fine, egg noodles are fine, elbows are fine. Any pasta is cool. Next we chop up some onions (and everyone should know by now that this kitchen diva favors Vidalia) and get some ground beef. Again, folks, not lean! Get something with at least 5% fat in it. A little bit of fat is essential here. Grab our big cast iron pan, coat with oil, like we do, throw in the chopped onions, get them a little soft and translucent and then add the ground beef. Keep stirring to continue cooking the onions and browning the ground beef. When they are almost done (the beef is still a little pink – but just a little bit), add a healthy splash of red wine. And please… please… please… never, ever, ever use what the grocery store sells as the cooking wine. No. Use real wine. You can have a glass while you are cooking, if you’d like. But the so-called “cooking wine” tastes awful and has way too much sugar in it. Just forget it. It doesn’t exist in our sophisticated culinary universe. Anyway, back to our cooking. Once the beef and onion mix is ready, get it on top of your pasta, but instead of tipping it over the pasta, scoop it out with a slotted spoon instead. There is going to be some onion juice, beef fat, little beef pieces and red wine left in the pan, and we want to save up as much of it as possible. If things were a little lean and there, add another splash of red wine. Reduce like we did before with the balsamic. 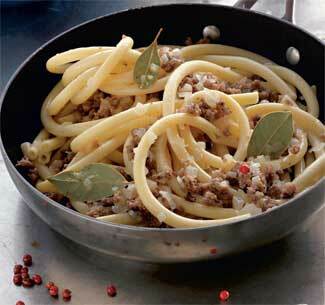 Pour on top of your pasta with ground beef and onions. What you now have is the classy version of Aeroflot macaroni. Toss a quick salad to go with it and you are golden. I am particularly happy with this last bit, because I came up with it myself, when trying to put a new spin on a favorite dish. This is a fun one to make on a family night or to cook with your spouse, because there is some slicing and dicing involved. 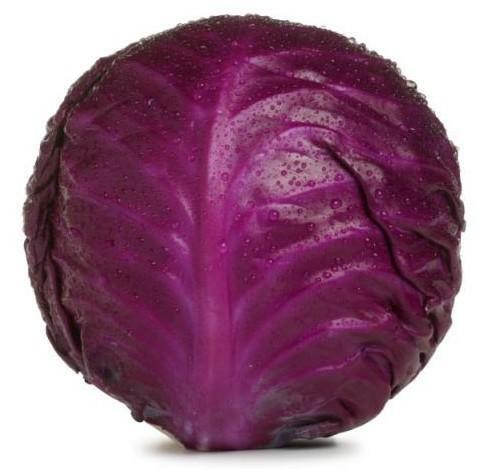 We start with a small red cabbage, a small red onion, or a shallot or a quarter of a Vidalia onion. We also need half a coil of smoked sausage, sour cream and some basic cheese, like a sharp cheddar. Chop up the cabbage and the onion. Slice the sausage. Oil the cast iron pan, add the cabbage first and stir to get it coated with oil. Then add the onion, keep stirring, and lastly add the sausage. Stir it all thoroughly, get it mixed well, then reduce the heat to medium low and cover. This is where it helps to have a transparent pan cover (remember we talked about this? ), because very shortly you will see your mix begin to “sweat” profusely – lots of condensation on the underside of the cover. That is exactly what we want. What we are seeing there are all the juices from the cabbage and the onions, mixed with some of the fat from the sausage collecting on the cover and then dripping back down, saturating everything in the pan with flavor. You do want to stir it periodically to keep it from sticking, but cover back up as soon as possible. The cabbage is your readiness indicator here. As soon as it goes from being purple to a little bit duller in color and softer in texture, the dish is close to being done, which means it’s time for our sauce. Shred enough cheese to fill a small handful. Set a sauce pan (it’s the littlest pan in any pan set) on low heat. Add two large spoons (like serving spoons) of sour cream into the pan. Let it heat up a little bit, then start stirring and slowly add your shredded cheese – just toss it in there in large pinches. Keep stirring. This is going to be a little slow, as it often with when working with dairy products, because we don’t want things to burn and scorch. This is a good time to turn off the heat under your cabbage and sausage mix, but keep it covered. As you keep stirring, you will notice your cheese beginning to melt – it will first start forming streaks in the sour cream and then mix with it completely, making this lovely, smooth, creamy sauce the color of rich butter. As soon as it gets to that point, turn off the heat under it and designate someone to keep stirring it while you serve up the cabbage and sausage. Grab the sauce pan (not with your bare hands!) and pour the sauce on top of the servings of cabbage and sausage. Decorate with a sprig of parsley on top. Voila! Delicious and nutritious. You can use the same sauce with a lot of other things – sautéed beets, fish or chicken, or a pasta dish. This particular option just happens to be my favorite, because it’s colorful and delicious, but is also a good combination of vegetables, dairy and meat. If you don’t tell them it’s good for them, your kids might even eat it.